As you all know Chitika is one of the most preferred advertising sties after Google Ad Sense. Most of the blogger who have been disabled, banned from Google Ad Sense are now using Chitika as a source of income from there blog. But, till now most of the people are still trying to find a way to increase their earning from chitika as the PPC or CPC of chitika is very low in comparison to Google Ad Sense. Most of the blogger are finding it hard to earn from it on a regular bases. 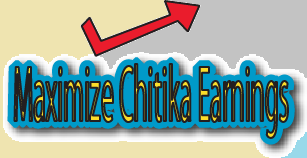 Today, I am going to revel some of the major factor on which Chitika depend on and how you can maximize your chitika daily earnings. Chitika is a Search based advertising website. This means that when every a person surf the web and from Google they visit your page, the ad’s on your blog are according to the search query of the visitor. This makes your ad more clickable and makes you earn more. So, more SEO optimized your blog will be more there is a chance to earn more from organic traffic. Chitika Ad’s are generally search result types. This means they are shown a result of search anyone have made on your blog. Now a day’s Chitika Ad’s are available all around the world so you have more chance to get more and more clicks on your ad’s from every country. Now talking about the main thing on how actually increases your chitika earnings. Basically there are some ways by which you can increase your Chitika earnings. As you all know that Google+ is the best platform to get USA traffic to your blog. Most of the chitika users have noticed this, that if they promote their blog on Google+ rather than more on face-book they have better earnings on that day. 4. Add Fresh and Quality content on your blog. As I have experienced, most of the bloggers are very irregular in their blogging and post 1-3 article per month. This is the main reason for not a regular income from Chitika. To have a steady from of cash and for making your income steady it’s really important to keep your blog update regularly.